With his third term in office coming to a close, Morro Bay Mayor Jamie Irons announced he would not run for reelection this November. Vying to replace Irons are: Councilman John Headding, businessman John Weiss and activist Jeff Heller. Headding, a pharmacist by trade, is also the owner of Morro Bay Drug and Gift. He is currently wrapping up his first term on the city council. Weiss is the longtime owner of Coast Electronics, which has locations in Morro Bay, San Luis Obispo and Paso Robles. Additionally, Weiss previously served four terms as the president of the Morro Bay Chamber of Commerce, and he also served as president of the Rotary Club of Morro Bay. Heller, a project manager for public and private sector developments, has served recently as the leader of Citizens for Affordable Living. 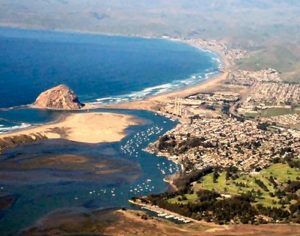 The group is opposing Morro Bay’s current sewage plant project and the city’s pending water and sewer rate hikes. In the Morro Bay council race, the seats belonging to Headding and Councilman Matt Makowetski are up for election. Makowetski has yet to announce whether or not he is seeking reelection. Dawn Addis, the co-founder and organizer of the Women’s March San Luis Obispo, has announced she will run for a council seat. It is unclear who else will enter the race. I’m still of the belief that the plant can be built right where it is at,now being able to utilize the old concrete plant next door, as was said in another post here on CCN about the quazie(sp) non goverment groups,like the IWMA,CARB,Ca Coast comm, thses groups really have no power,it is just that the higher ups in the govt believe that is what they want,while the people suffer, force the CC to put this right and get us some relief. This is not an issue like los Osos,we have a sewer plant that is working. Morro Bay needs a leader, hope the voters realize how important this election is for the financial well being of our community!!! When moving it first came up, it was publicly stated that it wouldn’t cost that much money, Their partner, Cayucos said woe there fellows, why don’t you do some diligence on this issue, instead Morro Bay went before the Coastal Commission and asked that the project be denied, a scorched earth move to push the Plant to a new location. What many don’t realize is, three other Sewer Plants on the California Coast, have been upgraded since this started, with as close or closer proximity to Ocean. The good news is that, Cayucos got away from the Morro Bay train wreck, tomorrow Cayucos (8/10/18) is having their Sewer Plant ground breaking ceremony!!! Yay Cayucos, what a great job you guy’s have done, and at a fraction of the cost, had you stayed connected to Morro Bay!! !